The Knit Stitch. Two Methods of Knitting. The KNIT STITCH is one of the two major stitches in knitting Knit and Purl Stitches. There are two possible ways of knitting this kind of stitch. less traditional way THROUGH THE BACK LOOP. Sometimes we call it "Granny's knit stitch". Does it matter how to knit them? Let's look at the design of a loop located on the knitting needle. Each loop hanging on the needle consists of two half-loops. The one which covers the needle is a FRONT LOOP. That one which is located under the needle is a BACK loop. 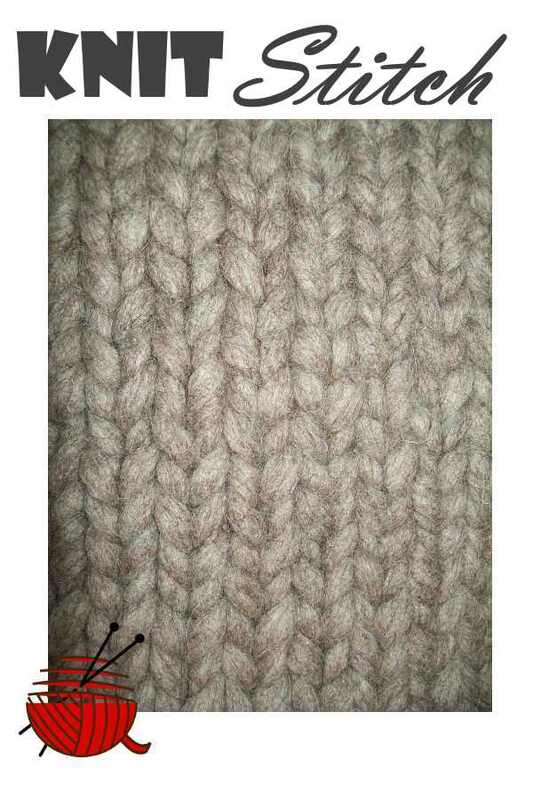 The look of the knitting fabric depends whether you use front or back loop for knitting stitches. If you would like to have your stockinette fabric looking neat, you have to remember a few things. BOTH knit and purl stitch have to be knitted either through their front or through their back loops. As a rule, stitches being knitted through the back loop produce a better quality fabric to compare to the front loop knitted stockinette fabric. Variant # 1. Knit Stitch Through the Front Loop. Drop the first loop off of the source (left) needle to the working (right) needle. Yarn is on the back side of the needle. Insert the working needle, from left to right, into the first loop on the left needle. Wrap the yarn in back counterclockwise, and pull the wrap through the first loop. Drop the first loop off of the right needle. Yarn is on the back side. Drop the first loop off of the left needle to the right needle. Insert the working needle, from left to right, into the first loop on the left needle. Wrap the yarn in back counterclockwise, and pull the wrap through the first loop. Drop the first loop off of the right needle. Here is a video for you to practice. This knitter uses the continental style of knitting. The only difference for those who prefer to use English style of knitting will be the supply of the working yarn by the right hand. All the rest is EXACTLY the same. Variant # 2. Knit Stitch Through the Back Loop. 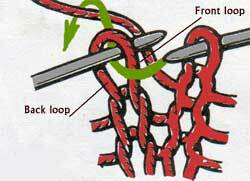 Working a stitch through its back loop is presented in the table and a short video below. Practice tells us, that this method combined with a purling a purl stitch through its back loop will produce a better quality stockinette fabric than using the front loop knitted stitches. Yarn is on the back side. Drop the first loop off of the left needle to right needle. Insert the working needle, from right to left , into the first loop on the left needle. Wrap the yarn in back counterclockwise, and pool the wrap through the first loop. Drop the first loop off of the right needle. The library of the knitting videos can be found at Needlework Videos page.